-Please plan to stay the whole time. -Our collective presence creates a sacred container for transformation. 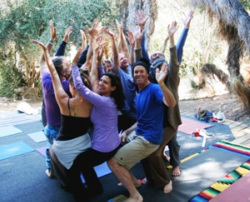 Joanna's JourneyDance Retreats are about building community through connecting with our hearts, and heart to heart. We support one another, as we are, not as we “wish to be” in a spirit of playful joy and shared release. These retreats offer a vibrant and sacred space for healing. Providing a safe container for release, Joanna and her team support participants in a playful and nurturing way. Scroll down for a list of items to bring with you. My mission is to support people to feel comfortable in their own skins, to relish themselves just as they are, to recognize that we all have quirks, challenges and imperfections, and to begin to look beyond those to the passion and beauty within. I am not about changing the outside to meet some expectation of beauty and "perfection," but about enjoying the beauty we already are, just as we are. We are each shining perfection within, but over time we become encased in layers of expectation, comparisons and fears. Through the practices of the retreat, we begin to shed some of those layers and let our natural beauty shine. I endeavor to hold up a mirror to participants and allow them to see their inner glory. Read more about Joanna here. Here is a list of things we suggest you bring. 2. Your own linens and blanket/sleeping bag if you are in a bus or dome. 3. A good solid flashlight for each person. It gets very dark at night. 5. Biocompatible shampoo and soap - go to health food store - Dr. Bonner’s soap and Aubrey's shampoo are the best (all the water leads to the trees). 6. A water bottle or two. 8. Solid shoes and sandals are nice as well! A sun hat or sun glasses if needed. 10. Additional vegetarian snacks if you wish (can be eggs and dairy) (there is arefrigerator and stove in the community kitchen if you need them). 11. Item(s) for a temporary community alter to be set up all weekend. 12. A good sense of adventure and humor. 5. Musical Instruments!!! It would be lovely to have a jam session one night. To download this list and directions, click on the links below. To Register, Choose Payment Option Below.